This page features links to other Web sites that contain information, news, analysis, humor, research or collections related to Mohammed and the controversy of depicting him. Note that some of these links date back as far as 2006, and as a result many of them have expired or have been taken offline for various reasons. We will try to keep the links here as current as possible, but inevitably more will go offline one by one with every passing month -- so don't be surprised if not all the links below still work. Diana West: Fear leads to dhimmitude over cartoon violence. Answering-islam.org has a perceptive article on the controversy with an extensive collection of links. Brokeback Mohammed, an extremely well-made parody of Brokeback Mountain, but this time starring Mohammed. A Memo to the Saudi Royal Press Secretary from the Religious Policeman features The Mohammed Image Archive. Aaron's CafePress shop has a vast selection of outrageous Mohammed- and Islam-themed satirical t-shirts, bumperstickers, coffee mugs and more. "There's a picture of the Prophet Muhammad on the back of my shirt" says this sarcastic t-shirt from TShirtHell. This YouTube video shows crazed Finnish extremist comedian Seppo Lehto drawing an insulting sketch of Mohammed. 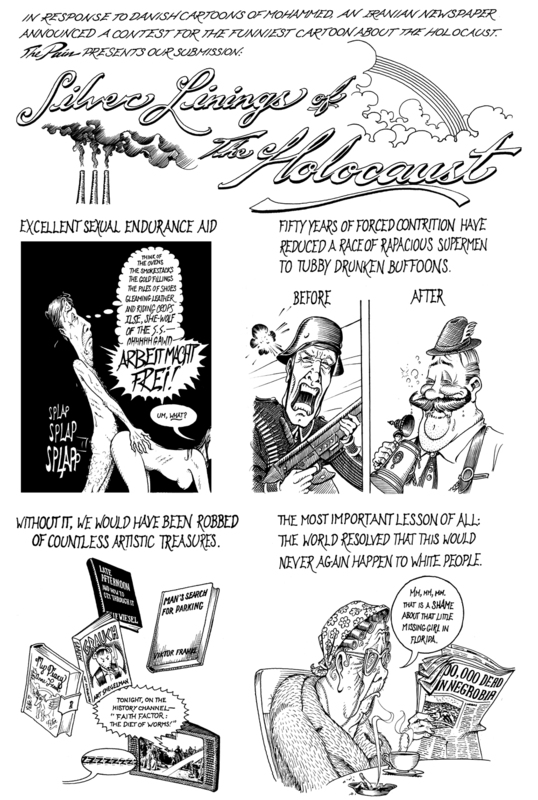 As a response to the Danish Mohammed cartoons, the Iranian newspaper Hamshahri sponsored a contest for anti-Semitic cartoons "about the Holocaust" in an attempt to show that freedom of speech in Western countries is not universally accepted on all topics. An Israeli comic group called Boomka.org decided to out-maneuver the Iranians by sponsoring their own anti-Semitic cartoon contest, with the entrants to be drawn mostly by Jews themselves and the winners to be displayed at an exhibit in Tel Aviv. Iranian anti-Semitic Holocaust cartoon contest submissions. Anti-Semitic cartoons from contemporary Arab media. Major anti-Semitic motifs in Arab cartoons. The Jawa Report has a photo essay of the Cartoon Protests around the globe. This scholarly essay by Wijdan Ali entitled "From the Literal to the Spiritual: The Development of the Prophet Muhammad's Portrayal From 13th Century Ilkhanid Miniatures to 17th Century Ottoman Art" traces the history of Islamic depictions of Mohammed. It can also be downloaded as a pdf document here. 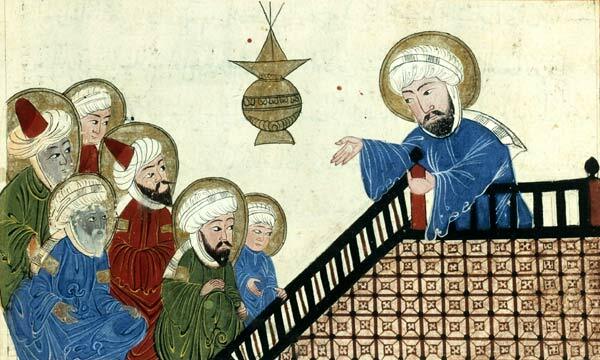 The scholarly journal Studia Islamica published an article by Oleg Grabar in 2003 entitled "The Story of Portraits of the Prophet Muhammad," which details (with words) the long history of Islamic depictions of Mohammed. TheReligionOfPeace.com keeps tabs on all the latest news about Islamic extremism, including terror attacks, attempts to impose shari'a in the West, and any protests or violence related to "Mohammed cartoons." "I cobble together a verse comedy about the customs of the harem, assuming that, as a Spanish writer, I can say what I like about Mohammed without drawing hostile fire. Next thing, some envoy from God knows where turns up and complains that in my play I have offended the Ottoman empire, Persia, a large slice of the Indian peninsula, the whole of Egypt, and the kingdoms of Barca, Tripoli, Tunisi, Algeria, and Morocco. And so my play sinks without trace, all to placate a bunch of Muslim princes, not one of whom, as far as I know, can read but who beat the living daylights out of us and say we are 'Christian dogs.' Since they can't stop a man thinking, they take it out on his hide instead." The Plus Ultra Blog reports that KATU-TV in Portland showed all 12 of the original Jyllands-Posten cartoons on the air during a report about the Web sites (including the MIA) that were banned in Pakistan (see the "BBC [Urdu Edition]" below for more info). Video of the TV segment is available on the Plus Ultra site. Danish Mohammed Cartoons is a site that monitors the ongoing cartoon jihad, with frequent updates and in-depth information about the original Mohammed cartoon scandal and other stories relating to the clash between the European and Islamic worlds. DailyKos post with links to and examples from the Mohammed Image Archive, plus discussion of the Islamic tradition of depicting Mohammed. Hodja's blog from Denmark has interesting news stories and images about the ongoing cartoon jihad -- partly in Danish, but some in English too. The Chester Beatty Library in Dublin has put up a display of Mohammed images. Faithfreedom.org has a few computer-generated pictures of Mohammed which appear nowhere else. If you speak French, the site "islam-documents.org" has a comprehensive collection of essentially all historical texts about Islam, translated from Arabic into French, to be used as source material for research. Mohammed was ethnically Jewish, according to this French site. Andres Serrano's "Piss Christ" (photo of a crucifix in a jar of urine). Chris Ofili's "The Holy Virgin Mary" (made from paint and elephant dung). A far-left student newspaper in Oregon called The Insurgent tried to prove some kind of point by publishing a picture of a naked Jesus with an erection, seeking to "teach a lesson" to Christians about what it felt like to have their prophet mocked. Though the image was vastly more offensive than the original Danish Mohammed cartoons, there were no riots or death threats issued over the Jesus cartoon, which was probably the reverse of what the editors of The Insurgent were trying to prove. 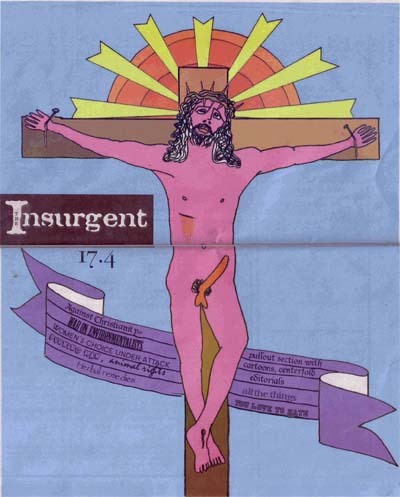 The "erection Jesus" was only one of 12 different anti-Jesus cartoons published by The Insurgent. Since Jesus is already mocked incessantly in mainstream Western culture, the students' attempt at outrageousness fell flat. The Pioneer (New Delhi), March 14, 2006: A column in this Indian newspaper links to and refers to the Archive, as part of an excellent essay on religious hypocrisy. BBC (Urdu edition), March 3, 2006: an article in the BBC's Urdu-language (Pakistani) edition contains a picture of an official document from the government of Pakistan showing that the Mohammed Image Archive was among twelve sites banned in Pakistan -- according to the Plus Ultra blog which has been following the case of the Pakistani government blocking certain Web sites that display Mohammed images. AccessNorthGa.com, February 28, 2006: article about a lecture on the cartoons by a Danish professor links to the Archive at the end. The National Review, February 13, 2006: article that links to and derives much of its information (though uncredited) from the Archive. Rocky Mountain News, February 11, 2006: column with a link to the Archive. The Nation magazine, February 9, 2006: article about the Archive, with extensive use of the information found here. The Australian newspaper, February 9, 2006: column that mentions and gives the URL of the Archive. The Philadelphia Inquirer, February 9, 2006: article that refers to the archive and makes use of information found here. The San Francisco Chronicle, February 8, 2006: column that links to the Archive. The Sydney Morning Herald, February 8, 2006: column with a link to the Archive at the end. The Times of London newspaper, February 4, 2006: an article entitled "Portraying prophet from Persian art to South Park" copied the information off the Mohammed Image Archive (which was not credited). (Update: The Times added a link to the Archive at the end of the article after readers pointed out it was the source of the information.) The Australian republished the same article on February 6, 2006. Ekstra Bladet newspaper in Denmark, February 1, 2006: article about the Archive (in Danish). Wikipedia references the Mohammed Image Archive (footnote 74) in its entry about the controversy. Reporter: "This Islamic scholar says the crucial injunction in the Koran is against mocking the Prophet, or other authorities." Sheikh Haitham al-Haddad: "It's totally prohibited to do something that belittle the prophets of Allah, and depiction is part of belittling the prophets of Allah, from one['s] anger. Reporter: "Traditionally, Islam has frowned on any representations of living beings. 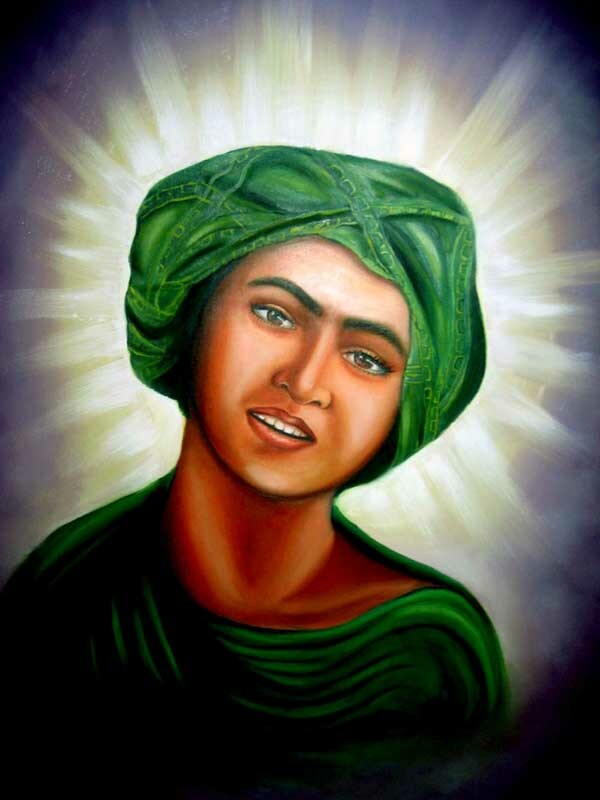 But painters in Islamic countries have depicted Mohammed for centuries." Reporter: "Despite official disapproval, portraits of the Prophet are sold to devout Muslims in Iran today." Sheikh Haitham al-Haddad: "Some people have a Muslim name, and they claim that, oh, they might have Muslim parents, but they have left Islam totally." Reporter: "But [gesturing toward Mohammed Image Archive pages] these are from, these are from medieval Persia, from the medieval Ottoman Empire, so surely they're Muslims." Sheikh Haitham al-Haddad: "No, not necessarily. Islam is a practice. It is not just a claim. Islam is a way of life. So, we practice Islam in our daily life in every inch and each aspect. It's not just a claim and then we can do whatever we want. No." Reporter: "So [pointing to Mohammed Image Archive pages] these pictures were wrong." Sheikh Haitham al-Haddad: "Of course. Hundred percent wrong." If you know of any other interesting depictions of Mohammed that you think should be included in the Archive, email suggestions here.